In a large saucepan or Dutch oven, heat olive oil over medium heat. Add onion; saute until tender, about 5 minutes. Add garlic, and cook 1 minute more. Stir in cumin; cook 5 minutes. Add turkey; cook until no longer pink. Add broth, beans, jalapeno, marjoram and savory. Bring to a boil. Reduce heat; simmer, covered, for 45 minutes, stirring occasionally. Uncover; cook 15 minutes more. 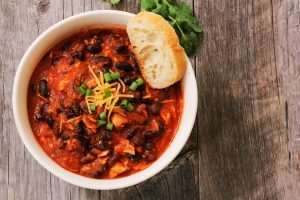 Dissolve cornstarch in water; stir into chili. Bring to a boil. Cook and stir 2 minutes. If desired, serve with cheese and sliced red onion. Per serving: 12g fat, 635mg sodium, 15g carbohydrate, 3g sugars, 29g protein. 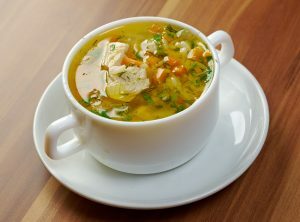 Find the original recipe here! Prep: 20 min. Bake: 20 min. Preheat oven to 425°. In a large bowl, mix first four ingredients; gradually whisk in oil. Remove 1 tablespoon mixture for brushing pork. Add vegetables to remaining mixture; toss to coat. 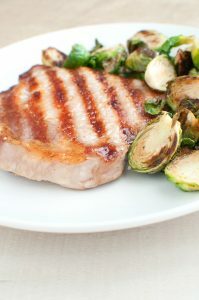 Place pork chops and vegetables in a 15x10x1-in. pan coated with cooking spray. Brush chops with reserved mustard mixture. Roast 10 minutes. Turn chops and stir vegetables; roast until a thermometer inserted in pork reads 145° and vegetables are tender, 10-15 minutes. If desired, sprinkle with pepper. Let stand 5 minutes before serving. 17g fat, 505mg sodium, 51g carbohydrate, 19g sugars, 39g protein. Original recipe can be found here! We love to highlight the success of our members! Here is the story of one client who has been working extra hard since joining Peak Performance Fitness several years ago. Read all about her accomplishments! 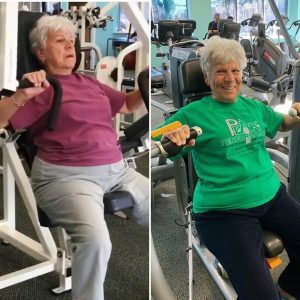 JoAnn has been a long time member of Peak Performance (check out the old strength training machines in that first picture) and has made some amazing accomplishments! She has been consistent with balancing her busy life and making time for her twice a week training sessions. In the past year, she made changes to her nutrition habits and has lost an incredible 30 lbs! 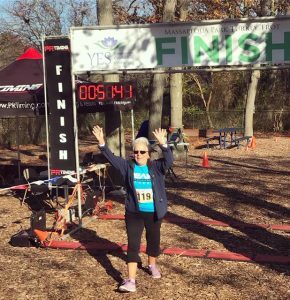 In addition to her committed training routine, JoAnn signed up to train with Team Peak last fall for the Massapequa Park Turkey Trot. She participated in eight solid weeks of training and crossed the finish line of her first 5k – smiling ear to ear! We are so proud of you & all your accomplishments!! We can’t wait to see what you do in 2019. The New Year begins with good intentions-plans for making positive changes to create a healthier lifestyle. 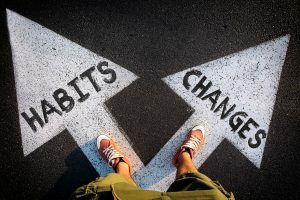 However, these changes will not happen overnight and it’s important to know that progress and habits take time. So how can we stick to these plans? What tools can we use to be successful? Start with these tips to get starting journaling and scheduling in order to hold yourself accountable. The New Year always starts off resolutions of new exercise programs and healthy eating habits. Many individuals begin a new exercise program with the best intentions, but may fall short of their goals. This can happen for a number of reasons, but often not seeing immediate results can be deterring. Maintaining an exercise journal helps a person keep track of progress. You are able to see firsthand how far you’ve come while sticking to a stead >exercise routine. Doctor appointments, kid’s soccer games, work meetings- these all end up on the calendar. They are appointments which need to be kept, same as your gym appointments with yourself or your trainer. Keeping a schedule is more effective than just keeping a to-do list. When you carve out time for a specific activity or project, you’re far more likely to stick to it. If it’s not on the calendar, you may forget about it. Prioritize your agenda by scheduling time for the gym and adding it to the calendar. Whether you are being honest with yourself or just knowing that someone (i.e. exercise physiologist or nutritionist) is going to read the journal, you are being held accountable. Food logs help make us self-aware of what are putting into our bodies-whether it’s too much or too little. Knowing that someone else is going to review the journal may also help us stay on the right path towards our goals. This journal can also be used to reflect back on successes or which areas still need improvement. In a large pot or Dutch oven, heat oil over medium-high heat and sauté onion, celery and carrots, stirring occasionally, about 5 minutes. Add mushrooms and garlic, cooking another 3 minutes. Stir in the chicken stock, bay leaves, turmeric, crushed red pepper, salt and chickpeas; bringing to a boil. Mix in shredded chicken, cover and turn down heat to a simmer for 15 to 20 minutes. Add kale, cover and simmer an additional 5 minutes. Discard bay leaves, serve and enjoy! Are You Getting in the Way of Your Own Goals? Call us today at (516) 599-8734 or email us at fitness@peakptfitness.com For More information!